On the 13th. of August, 1857 a truly momentous event occurred in Carnarvon, an event which made history; but sadly is all but forgotten these days. The scene was the Castle; the time was six o'clock in the evening; the chief player was a Frenchman, Monsieur Eugene Godard, but what exactly was going on? Well, Carnarvon and its inhabitants were witnesses to the first balloon ascent over Wales. The event was part of the Royal Welsh Yacht Club Regatta. Apart from the usual races this year saw the addition of a Grand Fete inside the Castle, which attracted a large number of extra visitors to the town; so much so that special trains were laid on from Chester, Holyhead, and other towns. 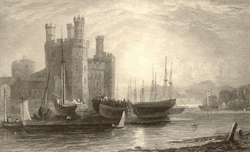 The town and Castle were full of spectators, lining the pier, quay, and Castle walls, and almost every spot which commanded a view of the Straits were packed. Several flag-laden yachts and other vessels lined the shore, an excellent vantage point for even more spectators. At the end of the day's racing the events were wound up with a Duck Hunt, which created much amusement amongst the crowd. 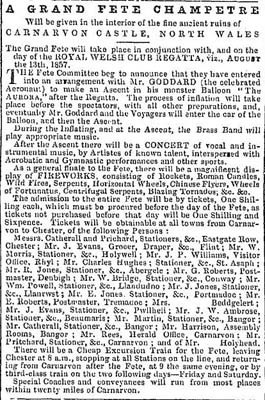 Further entertainment was provided by Rogers's Band, who were aboard a cutter moored off Porth yr Aur, and the proceedings were enlivened by "appropriate airs." When all the entertainment was over the large crowd retired to the Castle to witness Monsieur Godard's historic ascent. In contrast to the ever popular hot air balloons which were a common sight in France and London, Godard preferred gas balloons, and it was one of these contraptions, the "Aurora," which he brought with him to Carnarvon that day. 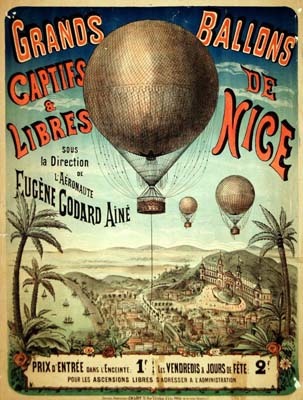 Eugene Godard was born in France in 1827 and made his first balloon flight in 1847 in a hot air balloon of his own manufacture. There followed a long career as a balloonist, initially across Europe, but he slowly built up his reputation and ventured further afield. At this time he used both hot air and hydrogen balloons. In 1854 and 1856 Godard arrived in the USA for a series of public flights, and it appears that he had a penchant for daring acrobatics and stunts; at least twice he sat astride a horse suspended beneath the basket as well as sometimes performing gymnastics suspended from a trapeze. He extended his 1856 tour into Canada, attempting to complete the first successful flight in that country. A few years earlier Montreal had established a reliable source of gas lighting through the New City Gas Company, which Godard used to fill his balloon. Unfortunately his balloon was accidentally destroyed in Boston on the 4th. of August 1856 which meant that when Godard arrived in Montreal he had to employ an army of seamstresses to put together a new one. The new balloon, named "Canada," was the first air vehicle to be built in Canada, and on the 8th. 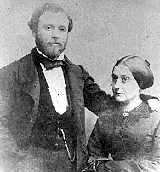 of September Godard completed the first balloon ascent seen in Canada at Quebec. Before returning to the USA he completed a further two passenger carrying flights. So it was that Godard arrived in Carnarvon on that day in August 1857, described as "the celebrated Aeronaut." The activities had commenced early in the morning when the process of inflation was begun. The Carnarvon Gas Works had agreed to provide 20,000 feet of gas, which was conveyed to the Castle from the nearest main by a 4 inch pipe. By half past six a vast crowd had assembled inside the Castle, and an even larger crowd had converged on the summit of Twthill, a rocky outcrop situated half a mile north east of the town, which was described at the time as "commanding a splendid panoramic view of the surrounding country for many miles." Those upon Twthill could not see the activity going on down in the Castle and had to wait until the balloon had cleared the Castle walls to witness the spectacle. The noise inside the Castle was thunderous, and it was only with difficulty that Godard could make himself heard to instruct his team of helpers who held on to the ropes. Finally Godard was satisfied with his preparations, climbed into the basket and gave the order to "let go." Amidst immense cheering, and with a brass band playing him off, the gigantic balloon ascended. At first the ascent was gentle, but it soon began to rise at a rapid rate. The Carnarvon & Denbigh Herald described the scene thus "The spectacle was a most interesting and exciting one." Advert for the 1857 Regatta. A curious sideshow occurred shortly after the balloon ascended in the shape of Mr. Jerome Greene Pym ap Ednyfed (real name Jerome Greene Jones Greene) who was a well-known agitator and "trouble maker" at the time. Seeing his chance of an audience he utilised a nearby rock as a handy platform and began delivering a "discursive harangue," in English and Welsh, upon Church, Law, and Social Reforms amidst great laughter and ironical cheers. The Herald reported "The lecturer, after some half-an-hour's talk, was escorted out of the Castle by the police, to prevent any disturbance of the public peace, which appeared rather threatening at one time." When the disturbance was over a concert then took place, with Mr. Stacey Germain and Madame Malanie performing "several comic and other songs," while Signor Wrgihtisi's act of "Balancing Extraordinaire" was greatly applauded. The concert terminated rather abruptly as the time for a firework display had arrived. The display consisted of "signal and sky rockets, brilliant stars, superb devices, with several other projectiles forming one of the most magnificent sights ever witnessed in Carnarvon." The early evening having become overcast, the balloon soon disappeared into the clouds. At this height Godard found conditions to be difficult, with the dense atmosphere impeding respiration, and the cold being intense. The balloon initially sailed in the direction of Llanddeiniolen and Llanberis but when it reached the apex of its climb the currents became "baffling in the extreme." Having been so disoriented and unable to calculate his position, he drifted for an hour or so until the clouds finally began to clear. Finding himself apparently over Parkia, and deciding that it was a suitable spot to land, he opened the valve and "let off steam." This resulted in a rapid descent, but missing his target he landed in the Menai Straits. He hit the water near Llanfair Church, but upon ballast being thrown out the balloon rose again and headed towards Llanidan on the Anglesey shore. Here it entangled itself in a tree for a time before working itself free. A large crowd had gathered to watch the spectacle and Godard threw out ropes, but the suspicious onlookers at first refused to take hold of them. Finally the ropes were taken and he landed safely in Llanidan Park. A number of those who had gathered in the park carried the balloon up to Carn, from where it was sent down to the ferry by a Mr. Parry. The whole episode created "an immense sensation" in the neighbourhood of Llanidan, but Godard was unaware of this as he was most hospitably entertained by the said Mr. Parry. He made his way back to Carnarvon that night, and was said to have been "comfortably smoking his cigar, and enjoying the company of his friends at 12 o'clock at night." Godard continued his aeronautical career for many years, and in July 1864 he performed another, celebrated, flight at Cremone Gardens in London. This time he flew a Montgolfier, a balloon powered by fire (hot air). This was a giant among balloons, designed and built by himself, which he christened "The Eagle." 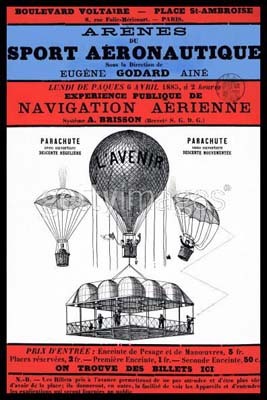 Eugene Godard instituted the art of aerial reconnaissance in 1859 at the height of the war between France and Austria, and in 1870 he designed and built a fleet of balloons specifically to carry mail and passengers out of a Paris which was under siege. His genius was recognised by the Emperor Napoleon III, who appointed him "Aeronaute de l'Empereur," or "Aeronaut of the Emperor." He died in 1890. So there it is, an account of an event which created a stir in Carnarvon at the time, although it is debatable whether those who witnessed it were quite aware of the historical significance of what they saw. Most probably regarded the whole event simply as a "fun day out" and would attach no importance to the spectacle, others would likely treasure the memory of the day they saw a man fly high into the sky in a balloon.